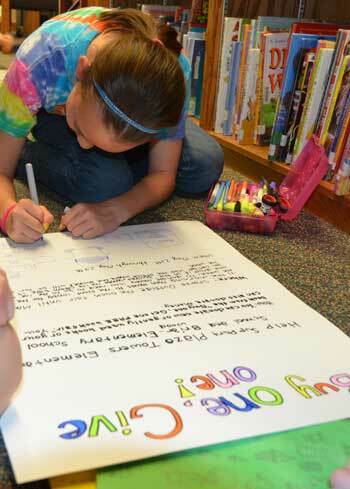 Maple Avenue students lead effort to help Oklahoma schools hit by tornadoes - Hamilton School District. Maple Avenue Elementary School fifth-graders will hold a book drive May 21-29 to benefit two Oklahoma schools hit by tornadoes. The Uniting Kids and Community (UKC) program, which gives fifth-graders an opportunity to organize and carry out service projects, asked families to give one instead of get one as part of the “Buy One, Get One Free” promotion at the school’s book fair. Students also encouraged contributions of other new and gently used books and financial donations to help elementary schools in Moore, Okla., replenish their library shelves. Money jars were available to accept donations at the book fair and the fourth grade Frosty Freeze ice cream sale. Community members interested in joining the student effort may stop by the school office until May 29. Checks are payable to the Maple Avenue Home & School. The goal of the fifth grade UKC is to engage and empower fifth grade students to make connections with their school, local and global communities. Students learn the value of civic responsibility and problem solving by participating in planning, coordinating, promoting and implementing service projects.